Norsafe has unveiled its new Marathon 900 RHIB-D model, described as a more spacious and robust evolution of the manufacturer’s high-speed Marathon 900 RHIB class. Taking its name from the D-fender configuration that has been added to the boat for its protection, the Marathon 900 RHIB-D has upped the original boat’s overall length, from 9.28m to 9.57m (see Technical Particulars, below), and increased the volume of available deck space. 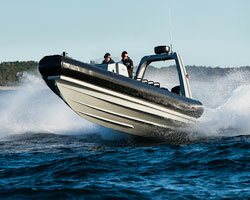 The boat is aimed primarily at military and professional users. Additionally, the deck layout has been overhauled to feature cargo track configurations, which, Norsafe says, were intended to make “the layout flexible and optimised for user-specific configurations”. The addition of grab-rails around the RHIB, plus the application of anti-skid surfaces to onboard step zones, are intended to lessen the risk of slips, trips and falls for her 12-strong personnel – especially when they are conducting operations at night. For this reason, the main deck has also been laid out as a flush, step-free arrangement. Norsafe tells Ship & Boat International: “The boat can be fitted with twin outboard engines: from two 86kW models to a maximum of two 224kW engines.” This is sufficient to enable speeds in excess of 60knots. Given this power, personnel ergonomics and comfort remained important considerations throughout the production process. Subsequently, the vessel’s console has been designed so that all main controls and switches are within direct reach of the pilot’s position. Norsafe adds: “The console has been designed with large, flat surfaces, making it easy to install additional mission-specific equipment”.Seating, meanwhile, can be customised to meet the customer’s specific needs: one option, for instance, is Ullman Dynamics’ shock-mitigating Patrol Jockey seats, designed to optimise user posture and to mitigate up to 70% of external forces. The Marathon 900 RHIB-D class’ hull and deck have been fashioned from composite material, namely vaccum-infused, glass-reinforced vinylester, for added robustness in harsh weather and sea conditions. The vessel also has self-righting capabilities. The stern has been developed with large open scuppers on each side, so that water drains automatically from the cockpit. Norsafe adds: “The radar arch has been produced with high-tech woven GRP mats, reducing vibration and damage to electronic sensors and equipment mounted on a large flexible mounting surface.” And, as another design consideration, the manufacturer says that the Marathon 900 RHIB-D’s navigational lights have been positioned in such a way that they do not cause reflections, nor light up the vessel in night time conditions, thus granting her patrol complement a serious advantage when conducting surveillance missions and/or discreetly pursuing targets.